We are delighted to announce the RCVS has received recognition from a pan-European association which accredits organisations which themselves quality assure higher education institutions and degrees. The European Association for Quality Assurance in Higher Education (also known as ENQA) took part in a visitation of the RCVS in April of this year, after we applied for recognition from the association in respect of its accreditation of veterinary and veterinary nursing education. During the visitation the panel from ENQA undertook a thorough review of the College’s structure and governance, its procedures and policies relating to the accreditation of veterinary and veterinary nursing education, the independence of the accreditation process and how decisions are scrutinised. excellent relationships with key stakeholders and active communication of its activities and achievements. improving the internal quality assurance including scrutiny of decision making processes by the Audit & Risk Committee. 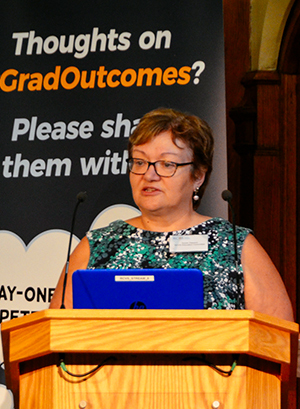 Professor Susan Dawson (pictured above right), Chair of the RCVS Education Committee, said: “We are delighted that the College has been accredited by ENQA on its first application for recognition – something that is apparently quite a rare occurrence! “We did a lot of preparation for ENQA’s visit earlier this year and appreciate the thoroughness with which they looked at the College, its structure, how it works and the way in which we accredit higher education institutions. “What the visitation demonstrated was just how useful it is to have a completely fresh set of eyes on how we do things and we are glad that, though areas for improvement were certainly found, the overall impression they had of the College was professional, thorough and dedicated, with a strong ethos on the importance of quality assurance. “We are already putting into place some of the recommendations made by the ENQA panel, for example, widening the pool of expert visitors for accreditation of veterinary nursing degree programmes and closer integration and consistency between our processes for accrediting veterinary and veterinary nursing degrees. “I would like to thank all the RCVS Council and committee members as well as staff who gave up their time to talk to the ENQA panel and particularly our Education and Veterinary Nursing Teams who spent a great deal of time and effort preparing for the visit." A copy of the full report can be downloaded from our dedicated ENQA page.